It's not what you'd call an ideal tow vehicle. Ordinarily, when we report on interesting or amusing YouTube videos we endeavor to not spoil the ending. This recent clip from Bug Bmx spoils the action right in the title, so if you aren’t particularly interested in watching nearly 18 minutes of wacky vehicular antics, yes, a Volkswagen Beetle can pull a small, empty, double-axle gooseneck trailer. Why wouldn’t it? 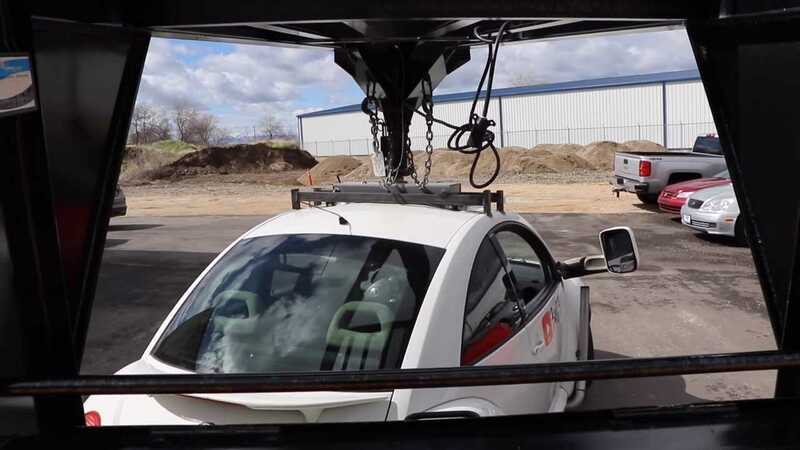 Such a trailer likely weighs around 3,500 pounds empty, and the Beetle in question is a 1998 model with the 1.9-liter TDI diesel under the hood. This video seems rather like a no-brainer, but actually, it’s not as cut-and-dry as you might think. For starters, that small diesel under the hood isn’t as robust as the later offerings from Volkswagen. It produced just 90 horsepower (66 kilowatts) and 155 pound-feet (210 Newton-meters) when new, never mind 21 years down the road. Power notwithstanding, there’s also the question of exactly where the trailer will connect with the car. Being a gooseneck, it’s designed to mount higher up – usually inside the bed of a pickup truck – instead of a bumper hitch down low. The only option for Bug Bmx is to bolt a hitch to Beetle’s roof, but therein lies another problem. The sheet metal across the roof isn’t exactly robust, and though the tongue of the trailer only carries a small fraction of the trailer’s weight, that could still be upwards of 300 pounds or more. Anyone who’s accidentally dented a roof while trying to perform some clever display of acrobatics will attest to just how easily it can buckle. If you haven’t experienced that personally, jump to the 6:45 mark of this video. Towing an empty gooseneck trailer with a Beetle isn’t so simple after all. After a bit more fabrication to connect the roof hitch to the car’s stronger unibody beams, all becomes well. Concerns about power were completely unfounded – the plucky VeeDub has no issues tugging the trailer in any direction, and in fact, its small size allows the Beetle to do a complete 360-degree turn beneath the gooseneck. The adventure ultimately turns out so good that Bug Bmx pledges to load up the trailer with all kinds of ballast for a future video. Whether or not the Beetle survives, it should at least be mildly entertaining.